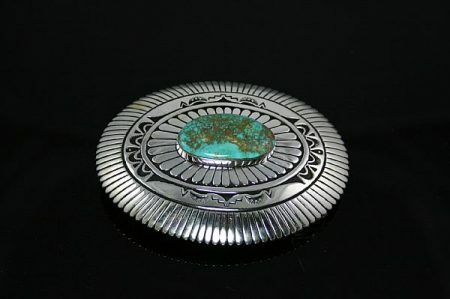 Stunning in design and execution, this fine pendant created by Kee Yazzie features a dazzling gem quality natural Kingman turquoise gem. The cabochon is deep sky blue with complex dark reddish-brown spiderweb matrix. 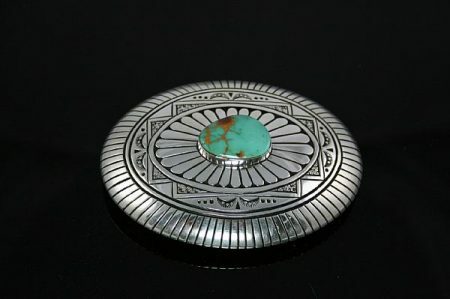 It sits in a hand chiseled bezel atop a beautifully overlaid pendant. 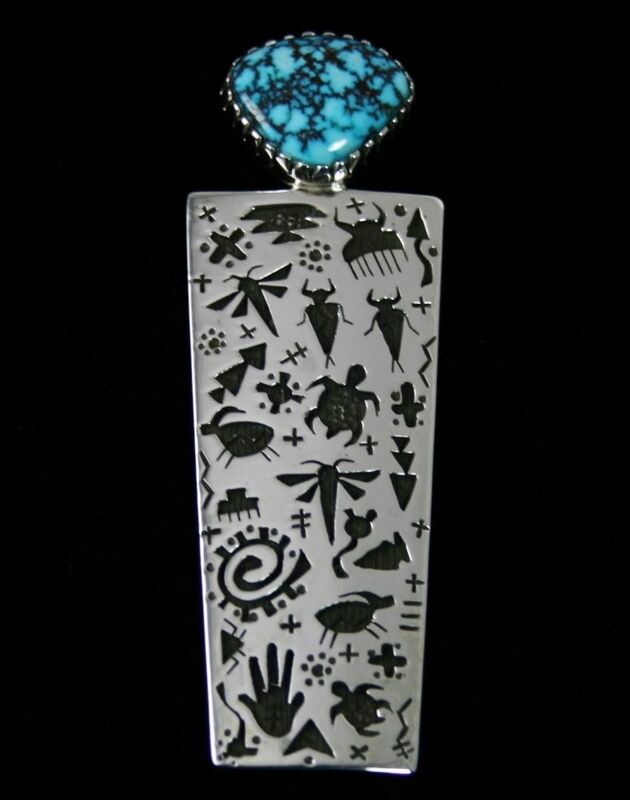 The overlay is signature Kee, cut out with a tiny hand made saw, the complex petroglyph designs mimic the canyon walls of his homeland. 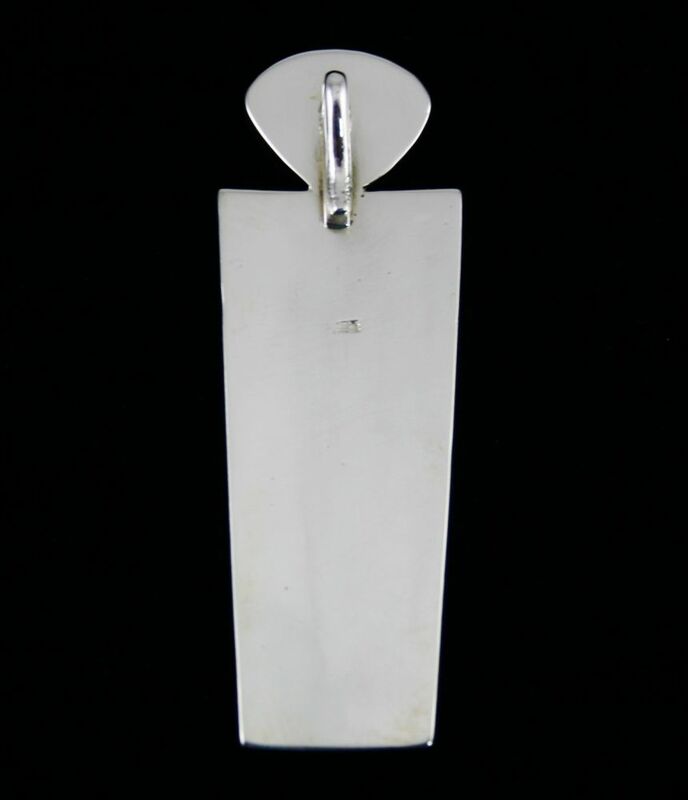 Pendant Size: 3-1/2 in. x 1-1/8 in. 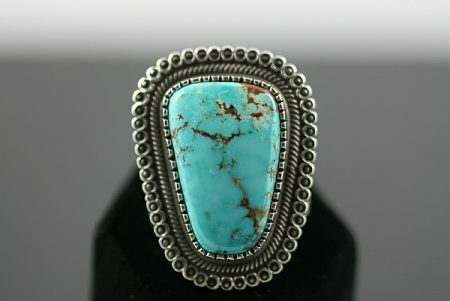 (at widest point) Stone Size: 13/16 in. x 11/16 in. Bale Diameter: 3/16 in. 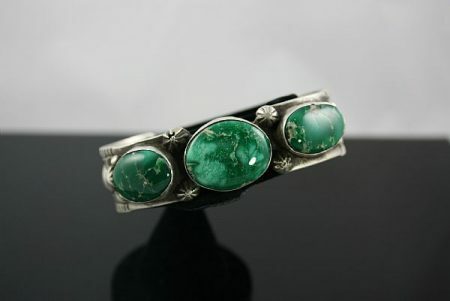 This piece created by Navajo artist Victor Hicks features three beautiful deep green Broken Arrow varascite stones. 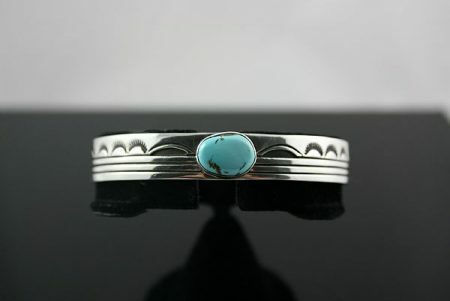 The item also features stunning traditional stamping and silver work. 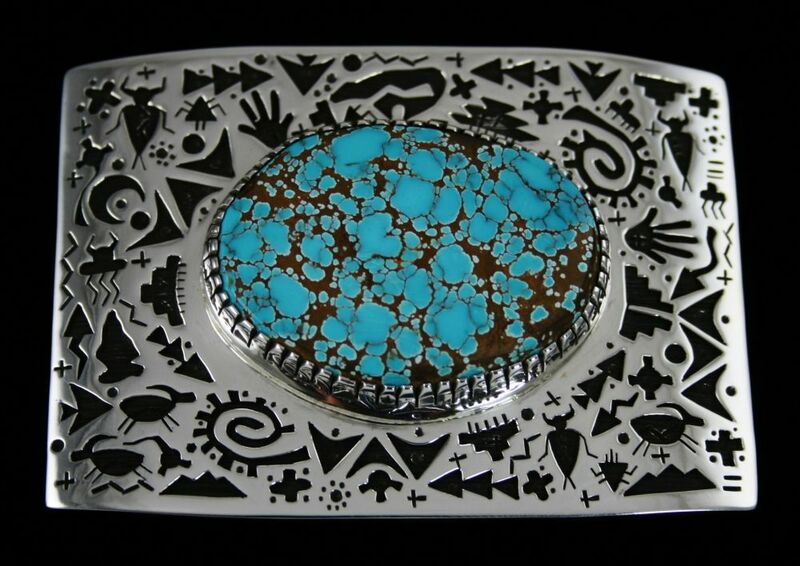 This piece created by award winning Navajo artist Terry Martinez features an incredible large Easter Blue Turquoise stone. 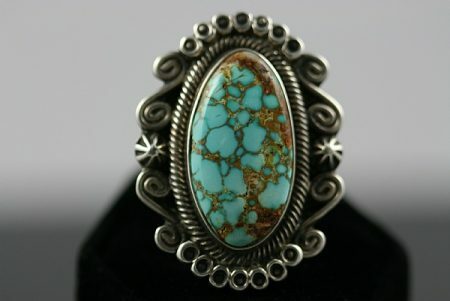 The cabochon has an eye catching light blue hue with chocolate brown matrix. 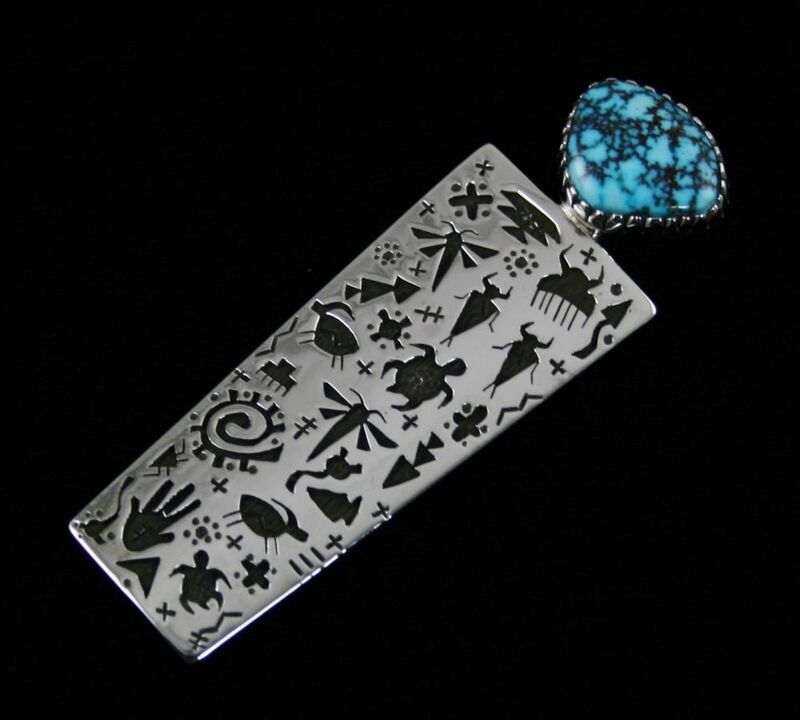 The silver work of the piece is beautiful as well in rolled and hammered sterling silver ingot with hand twisted wire, sterling silver droplets, and intricate detail on the shank. 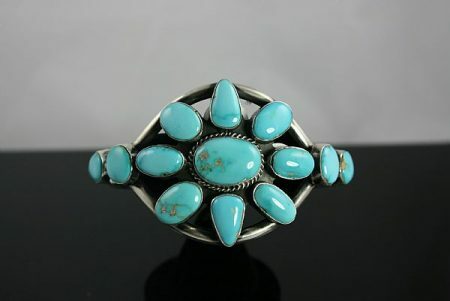 This piece created by Navajo artist Derrick Gordon features an amazing nine stone rare Royal Blue turquoise cluster and was custom designed to look like an exact replica of a 1930's cluster bracelet. 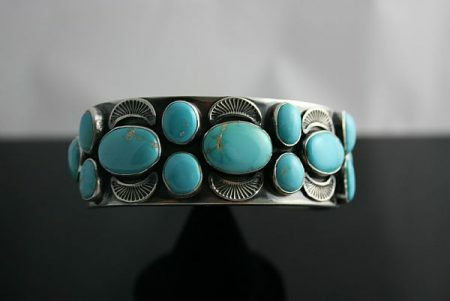 This spectacular piece created by Navajo artist Derrick Gordon features an incredible thirteen stone rare Royal Blue turquoise cluster and was custom designed to look like an exact replica of a 1930's cluster bracelet. 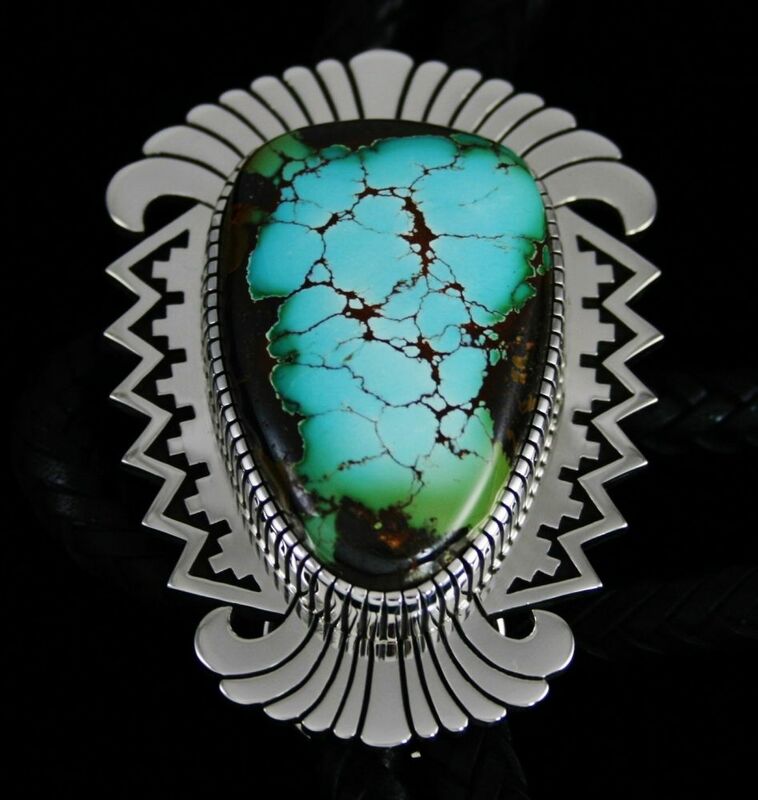 This gorgeous one of a kind piece created by award winning Navajo artist, Terry Martinez, features an incredible rare high grade Easter Blue Spiderweb turquoise stone. 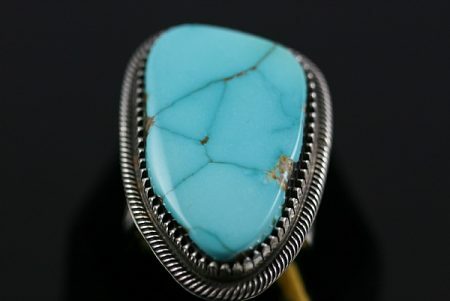 The cabochon is a beautiful sky blue with golden brown webbing. 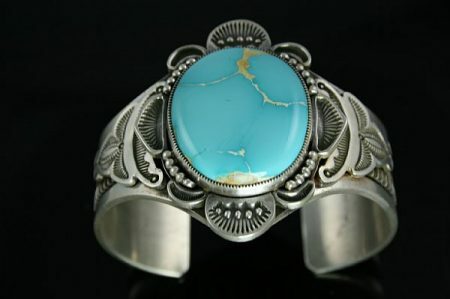 The item also portrays exquisite traditional silver work with an amazing use of hand twisted wire in ingot sterling silver. 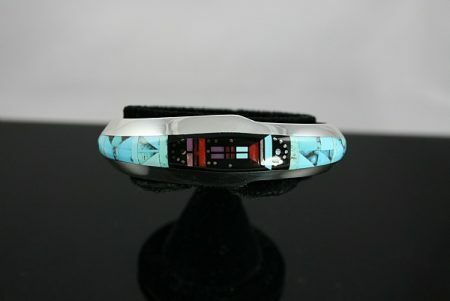 This gorgeous piece created by award winning Navajo artist, Jim Harrison, features incredible gem grade Mediterranean coral, onyx, sugulite, and Kingman turquoise inlay in a beautiful contemporary setting. 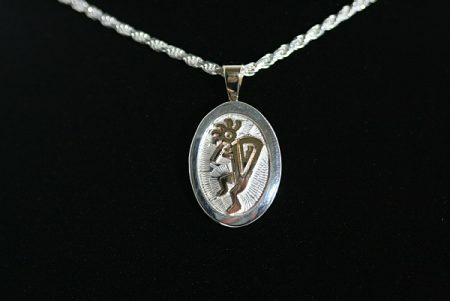 The item also features an amazing Yeibechai symbol in the center with flared edges in sterling silver. 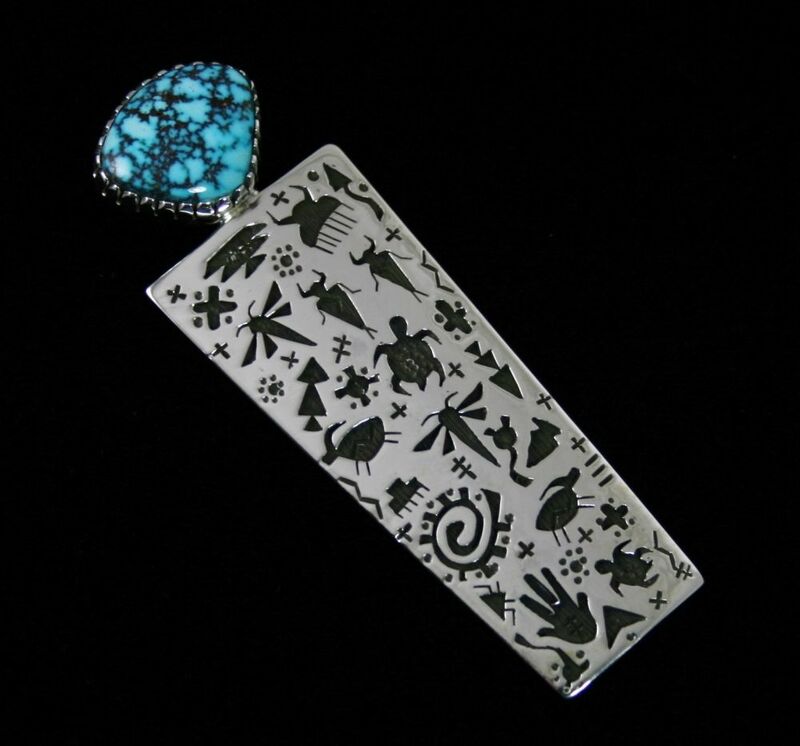 This gorgeous piece created by award winning Navajo artist Charlie John features beautiful lightly oxidized design work in sterling silver and an amazing Royston turquoise cabochon. 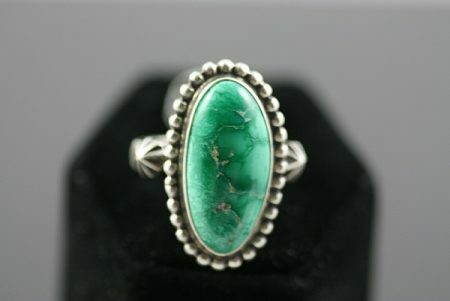 The stone is a gorgeous light green with stunning golden brown matrix. 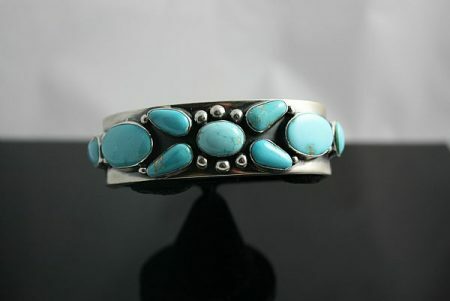 This beautiful piece created by Navajo artist Derrick Gordon features an amazing thirteen stone rare Royal Blue turquoise cluster and was custom designed to look like an exact replica of a 1930's cluster bracelet. 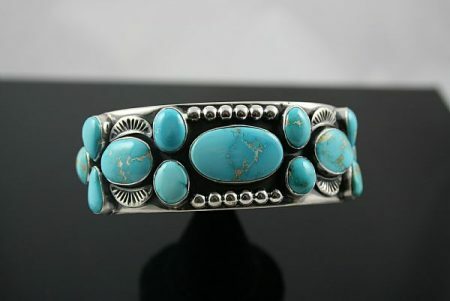 This piece contains 160 cts of Royal Blue turquoise.